The Virginia Department of Transportation (VDOT) is engaged in another hide-and-seek exercise to facilitate sprawl west of Haymarket. They’re back, trying to build new roads west of Haymarket that are not in the county’s Comprehensive Plan. The game plan is to use the massive “Transform I-66” project as an excuse to extend Heathcote Boulevard west, and build a bridge over I-66 connecting Heathcote to Route 55 near the Amazon data center. As they say on TV – but wait, there’s more. Prince William County has already restarted a study of another road, the developers’ dream known as the Buckland Bypass. It would run from Fauquier County north along the edge of the Bull Run Mountains. If a 4-lane divided highway replaced Thoroughfare Road south of I-66, how long before there’s a proposal to widen Antioch Road and build a 4-lane road parallel to Route 15 at the base of Bull Run Mountain north to Loudoun County? It’s another flavor of the Bi-County Parkway nightmare. Once again, VDOT is not being transparent or straight-up i n its Transform I-66 planning. The next round of I-66 public discussion, the Concept Plan meetings scheduled in June, has no discussion of any new construction west of Route 29. VDOT’s Concept Plan public meetings in June resemble the way magicians do something flashy to draw the audience’s attention to one side of the stage, while stuffing a rabbit into the hat. This is not VDOT’s first magician show on expanding roads west of Route 15. In 2015, after finishing all the public events to discuss how to improve I-66, the state transportation agency tried to sneak into the plan a new parking lot on Antioch Road, replacing an operating local farm with pavement. The public response, including a resolution by the Board of County Supervisors to save the Heflin Farm, was quick and loud. The parking lot was dropped before the I-66 project was approved by the Virginia Commonwealth Transportation Board (CTB). Now it’s back, though hidden quite well. You have until midnight, April 8 to submit your comments on this latest attempt. Yup, the deadline is that tight. VRE responded to the blog post VRE Extension to Haymarket Proposes to Remove 100 Cars/Day from I-66… At Cost of $468 Million. True, VRE did not provide the 100 cars/day number at the public meetings – but that 100 cars/day number is based on the information presented by VRE. – 600 riders equals 300 cars in the morning and 300 cars in the evening, if everyone drives alone. – 600 riders equals 100 cars in the morning and 100 cars in the evening, if each is carrying three people to avoid the toll after I-66 is “improved” with new toll lanes. VRE’s numbers about Vehicle Miles Traveled (VMT) are not the same as the number of cars/day. Do not confuse the VMT numbers with the number of cars removed from I-66. The VMT numbers do provide some insight. One car going from Gainesville to DC travels about 34 miles inbound and 34 miles coming home, or 68 VMT per day. The difference between retaining the existing Broad Run station vs. building three stations to Haymarket would be 55,300VMT/day, counting both inbound-in-the-morning and outbound-in-the-afternoon travel. At 68 VMT per vehicle per day, assuming everyone drove solo and paid the tolls required to travel on I-66 inside the Beltway, that equals 55,300VMT/68VMT per day. That would be 813 cars/day. If drivers chose to avoid tolls and carried two passengers, the the HOV3 number would be 813/3 or 271 cars/day. If the four VRE trains leaving Broad Run between 6:15am and 7:48am were completely full, They would reduce congestion on I-66 during that 90-minute period by 4,000 passengers. That would be equivalent to 1,333 cars if each carried 3 people, or 4,000 cars if everyone was driving solo, or about 75 OmniRide buses. The overall VRE system itself is an effective way to transport commuters. It is the proposed extension to Gainesville-Haymarket that fails the cost-effectiveness test. At $468 million to remove 100, 271, or even 813 cars/day… surely there is a better way to spend the taxes raised by the 2013 General Assembly to reduce traffic congestion. The Virginia Railway Express (VRE) is exploring if it should extend the line that runs from Broad Run through Manassas to Union Station, as well as add three new trains to carry commuters into DC each morning. The “full bore” expansion option is to build new stations at Innovation, Gainesville, and Haymarket, while closing the existing Broad Run station and the end of the Manassas Line That would require adding a second (and potentially a third) railroad track for the 11 miles to Haymarket, plus construction of a new railyard west of that town. Compared to the “minimal change” alternative of adding the three new trains but maintaining the existing station at Broad Run, constructing a new 11-mile extension to Haymarket would cost an additional $250-$350 million. Despite the expense for the additional infrastructure, VRE would carry only an additional 300 daily commuters each way in 2025 compared to the “minimal change” alternative. Adding additional trains but still using the Broad Run station would provide a better benefit/cost ratio than the alternative of building three new stations, new tracks, and a new railyard near Haymarket. However, retaining the Broad Run station would create a major problem with train storage. The railyard at Broad Run is limited in size. The current passenger platform blocks addition of the extra storage tracks that would be necessary, if VRE added three additional trains in each direction. 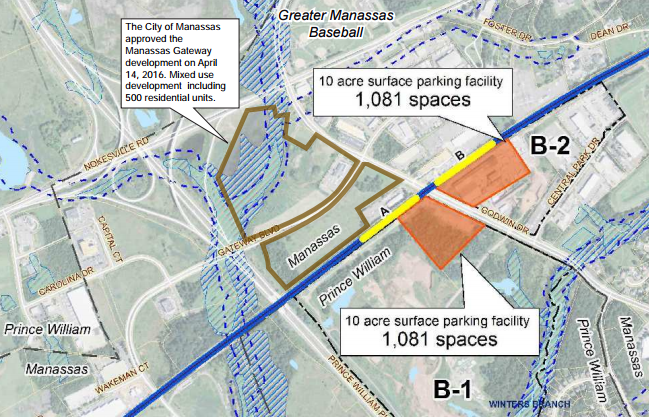 A third alternative, costing perhaps $10 million more than the “minimal change” option, is to build a new station where the railroad crosses Godwin Road in Manassas. Godwin Road would become the end-of-line station and the platform at Broad Run would be closed. 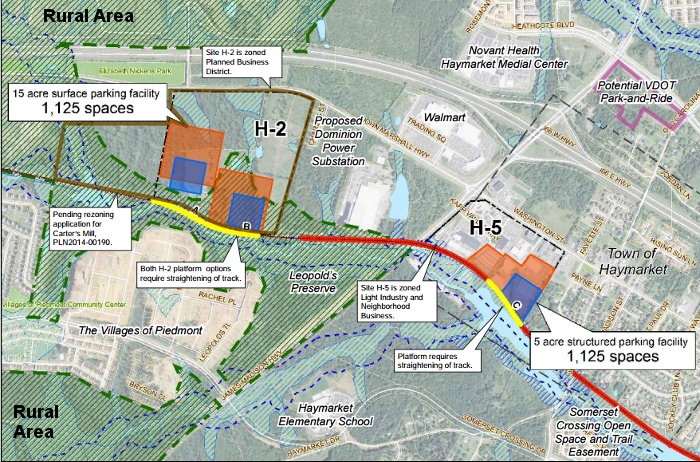 The Godwin Road alternative would allow expansion of the existing railyard. It would cost far less to implement the Godwin Road alternative, compared to the high costs of building an extension to Haymarket with three new stations and a new railyard . 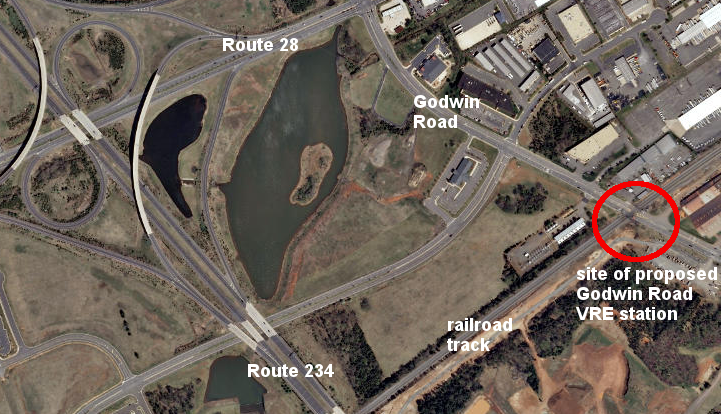 A Godwin Road end-of-line station would also minimize annual operating costs, since the trains in the yard would be located just 1.5 miles away from the location where service starts/ends each day. Most significantly, a station at Godwin Road is not underneath the flight path of Manassas Airport. Unlike Broad Run, the new end-of-line station could trigger transit-oriented development and create economic benefits consistent with the City of Manassas Comprehensive Plan. 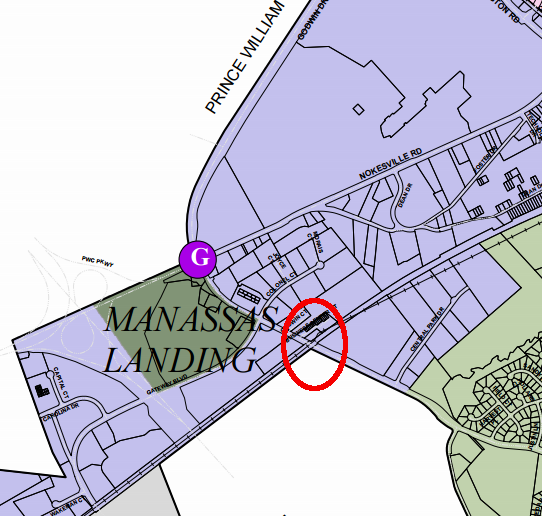 The Manassas Landing area is described as a “gateway” for development. Placing a VRE station there could result in high-tech companies choosing to locate there. Adding more trains to VRE would offer the potential for skilled workers living within the urban core to commute to jobs in Manassas without using a car. Planning for growth at Godwin Road provides a clear contrast to the planning by Prince William County for the land west of Haymarket. VRE has proposed a new station located west of Route 15, but at that site the station would be located within the Rural Area. The Rural Area is supposed to be a zone of low density development. Unless current land use planning is ignored in order to speculate on rezonings that would transform the area, there would be few (if any) economic benefits for a new VRE station located west of Haymarket. January 20, 2016 UPDATE: The Board of County Supervisors approved the addition of Madera to the Agricultural and Forestal District on January 19 in a 7-0 vote, but only after the landowner committed to cancel the request for a Special Use Permit. The Gainesville District supervisor negotiated that in advance. The Prince William Conservation Alliance spoke at the public hearing in support of commercial agriculture, rather than industrial operations, in the Rural Area. Normally, adding a farm in western Prince William’s Rural Area to an Agricultural and Forestal District would be a routine event. 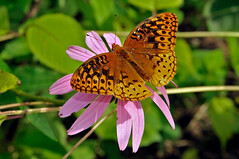 The county established that land use classification in 1973 to facilitate preservation of farms and forests. However, Madera “Farm” is not a normal agricultural operation. It resembles more closely an industrial operation, grinding mulch and processing construction and demolition debris.